The simplest way to expand your systems PCIe/PCI functionality is built right into this Expansion Enclosure (box). Easy to install, small enough to be portable, and the right add-on to expand PCIe capabilities. Metal cased enclosure suitable for industrial usage. Supports 1-lane 2.5Gb/s PCI Express data rate. The PCIx2 + PCIex2 Expansion Box is is designed to expand two extra PCI and PCIe slots from the PCI Express card slot of your Desktop, Workstation, or Server. The PCIe Host Card is installed in the computer then makes a connection from the installed host PCIe card to the expansion box. 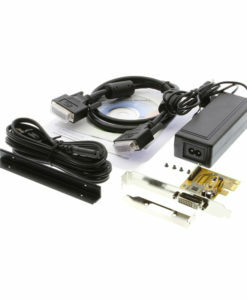 The PCIe expansion box instantly expands the computer systems Express Bus capabilities and must use the included 12VDC AC power adapter included in the package. The PCIe Host adapter card is connected to the expansion box with a 3ft cable spanning between the host and new PCI slots. 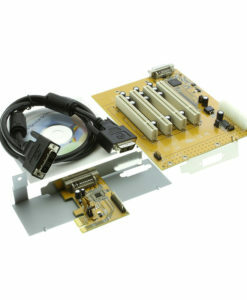 Expands 2 PCI 32-bit 33MHZ and 2 PCIe 1.lane slots over PCI Express Slot. 12VDC AC Power Adapter is required.